Windows 10 Fall Creators Update, comes with lots of features and this includes an improved photos app. This also includes new artificial intelligence features that make searching though your photos very easy. It also helps you create other photos and videos from your existing ones without hustle. We saw story remix demoed earlier this year and this is some what interesting. Search by person, place, or thing in the new app to quickly find what you are looking for. “Simply click on the search bar and images of people from your collection will appear. This makes it easy to click on the person you’re looking for. You’ll also see places and things that are already in your collection. Also if you know what you’re looking for, a photo from the playground, a video captured at Disneyland, or last year’s picture with Santa, just type those things into the search box and the automatically tagged photos will come up in your search. That’s right, the best part is, it’s all done for you through automatic intelligent tagging, no work needed on your end”. How cool is this? 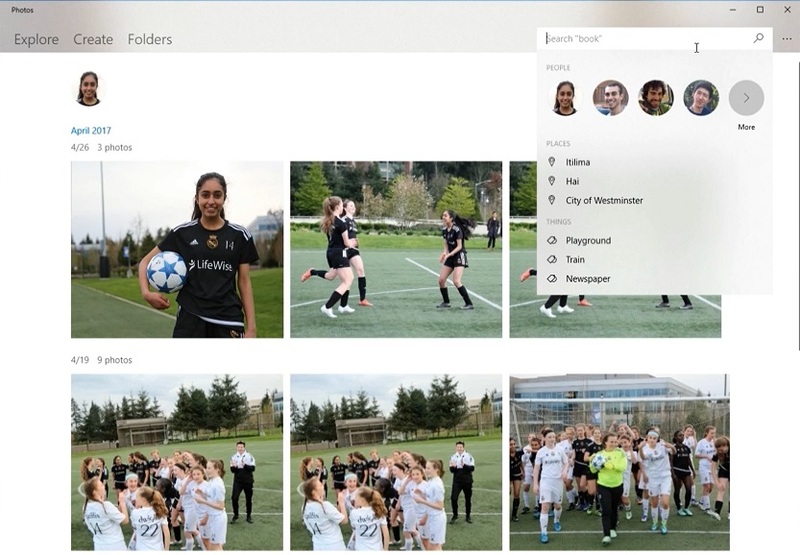 Now you don’t have to scroll through tons of photos to find that picture you need. The new video creation tool experience makes a pro out of a novice. Yeah like try it and tell me if not, lol. So how do you exhibit pro skills? “With the video creation tools in the new Photos app, no video editing skills are required. Using AI, the Photos app will automatically bring together your memories into a video for great storytelling complete with soundtracks, themes, and transitions. Keep the automatically generated video to enjoy and share, or easily remix it with just the click of a button for an all-new look and feel of the video, complete with a new soundtrack and transitions. AI enables the app to understand what music and transitions align best with your photos or videos”. Okay tell me if this isn’t awesome. You just watch the magic happen lol. Have you updated your device to the Windows 10 Fall Creators Update? give this a try and tell us what you think. Cheers!